Devil's club or devil's walking stick (Oplopanax horridus, Araliaceae; syn. Echinopanax horridus, Fatsia horrida) is a large understory shrub endemic to the arboreal rainforests of the Pacific Northwest, but also disjunct on islands in Lake Superior. It is noted for its large palmate leaves and erect, woody stems covered in noxious and irritating spines. It is also known as Alaskan ginseng and similar names, although it is not a true ginseng. Devil's club generally grows to 1 to 1.5 metres (3 ft 3 in to 4 ft 11 in) tall. Some stands located in rainforest gullies or moist, undisturbed areas can reach heights of 3 metres (9.8 ft) to 5 metres (16 ft) or more. The spines are found along the upper and lower surfaces of veins of its leaves as well as the stems. The leaves are spirally arranged on the stems, simple, palmately lobed with 5-13 lobes, 20 to 40 centimetres (7.9 to 15.7 in) across. The flowers are produced in dense umbels 10 to 20 centimetres (3.9 to 7.9 in) diameter, each flower small, with five greenish-white petals. The fruit is a small red drupe 4 to 7 millimetres (0.16 to 0.28 in) diameter. The plant is covered with brittle yellow spines that break off easily if the plants are handled or disturbed, and the entire plant has been described as having a "primordial" appearance. The plants are slow growing and take many years to reach seed-bearing maturity; this makes them very sensitive to human impact as they do not reproduce quickly. Shiny red drupes in elongate clusters (Mount Baker-Snoqualmie National Forest). This species usually grows in moist, dense forest habitats, and is most abundant in old-growth conifer forests in the Pacific Northwest.. It is found from Southcentral Alaska to western Oregon and eastward to western Alberta and Montana. Disjunct native populations also occur over 1,500 kilometres (930 mi) away in Lake Superior on Isle Royale and Passage Island, Michigan and Porphyry Island and Slate Island, Ontario. Devil's club reproduces by forming clonal colonies through a layering process. What can appear to be several different plants may actually have all been one plant originally, with the clones detaching themselves after becoming established by laying down roots. Large leaves extend from the top of spiny stems. Traditionally, the charcoal from the stalks is still used to make ceremonial and protective face paints, and among the Ditidaht and neighboring groups, it was equally significant to red ochre as a symbolic link to the spirit world. Native American peoples such as the Tlingit and Haida have used the plant as traditional medicine for ailments such as adult-onset diabetes, as well as rheumatoid arthritis. In vitro studies showed that extracts of devil's club inhibit tuberculosis. Additionally, devil's club has been shown to extend life expectancy and reduce leukemia burden in mice engrafted with murine C1498 acute myeloid leukemia cells. The plant has been used ceremonially by the Tlingit and Haida people of Southeast Alaska. A piece of Devil's club hung over a doorway is said to ward off evil. The plant is harvested and used in a variety of ways, most commonly as an oral tea in traditional settings, but also poultices and ointments. Because devil's club is often claimed to be related to American ginseng, some believe the plant is an adaptogen. The plant has been harvested for this purpose and marketed widely as "Alaskan ginseng", which may damage populations of devil's club and its habitat. Despite some morphological similarities between the araliaceous members Panax ('true' ginseng), American ginseng, Eleutherococcus senticosus ("Siberian ginseng") and devil's club, the different genera are chemically and ethno-botanically diverse, and in most cases, under protection in the wild. ^ Hulten, Eric (1968). Flora of Alaska and Neighboring Territories. ISBN 978-0-8047-0643-8. ^ a b c Pojar, Jim; Andy MacKinnon (1994). Plants of Coastal British Columbia. BC Ministry of Forests and Lone Pine Publishing. p. 82. ISBN 978-1-55105-042-3. ^ Turner, Nancy J. (May 1982). 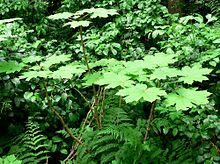 "Traditional Use of Devil's-Club (Oplopanax horridus; Araliaceae) by Native Peoples in Western North America" (PDF). J. Ethnobiol. Society of Ethnobiology. Retrieved 28 February 2013. ^ Inui T, Wang Y, Deng S, Smith DC, Franzblau SG, Pauli GF (Jun 1, 2000). "Counter-current chromatography based analysis of synergy in an anti-tuberculosis ethnobotanical". Journal of Chromatography A. 1151 (1–2): 211–5. doi:10.1016/j.chroma.2007.01.127. PMC 2533621. PMID 17316661. ^ McGill, et. al. (2014). "Extracts of Devil's Club (Oplopanax horridus) Exert Therapeutic Efficacy in Experimental Models of Acute Myeloid Leukemia". Phytotherapy Research. 28 (9): 1308–1314. doi:10.1002/ptr.5129. Wikimedia Commons has media related to Oplopanax horridus. Edibility of Devil's Club: Visual identification and edible parts of Devil's Club.